Make it yours! Cover includes space to personalize your directory (permanent marker or label recommended). 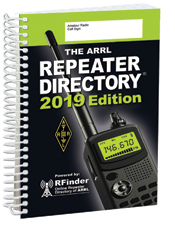 Please Note: The repeater listings that appear in The ARRL Repeater Directory® are provided by RFinder, Inc. If a repeater has been omitted, or if a listing is inaccurate, please report this directly to RFinder via the RFinder smartphone app, or on the web at rfinder.net/blog/add-repeaters. RFinder - The World Wide Repeater Directory web service and apps. RFinder’s steadily growing worldwide repeater database now includes more than 55,000 repeaters in more than 175 countries.